The World Health Organisation recognizes World Mental Health Day on October 10th every year to remind us the importance of awareness in a growing topic for the business world globally. In an era where most working people have less time and more stress, mental health has risen as a big topic for every industry, and the maritime world could not stay unaffected. Mental health issues in shipping industry relate to the nature of seafarers’ job which is characterized not only by intensive work hours, but also by isolation, being away from family for too long, fatigue, and many others. This international day aims to raise awareness on mental health and put an end to the stigma that has forced many to suffer in silence. We all need to take mental health seriously and help in any way we can. Shipping industry has taken significant action toward that issue, in an effort to give seafarers’ mental wellbeing the priority that it so profoundly deserves. According to WHO, half of all mental illness begins by the age of 14, while suicide is the 2nd leading cause of death in the 15-29 age group. A survey to more than 1000 seafarers by Yale University and the Sailor’s Society showed 26% of seafarers had felt “down, depressed or hopeless”. Organisations which prioritise the safety and welfare of their seafarers over business costs and performance have more developed safety cultures, lower levels of fatigue and sleep problems among their crews, according to a study by AMSA, University of Queensland and University of Western Australia. A recent report by Inmarsat revealed a significant correlation of connectivity onboard with relaxation, showing that even limited access to Wi-Fi onboard ships helped reduce some of the emotional stresses that come with separation from families. What causes anxiety onboard cannot be exactly defined, as it often relates to multiple factors and their complex correlation. For seafarers, the demanding working environment with intense shifts and the different duties onboard is enough by itself to disrupt internal peace. But then it comes the separation from family and loved persons which, combined with poor connectivity and multi-nationality, creates a sense of loneliness and isolation. What is more, the limited recreational activity may affect them; let us not forget that seafarers often spend their work break inside their working environment! However, these are only the general factors that can objectively lead to a ‘mental health issue.’ First of all, we cannot forget that seafarers are human beings exactly as each one of us and can deal with their own personal problems and concerns, which they find harder to solve when they are far-far away. In line with a general awareness over the last years, mental health has gained an increased interest from the shipping industry comprising shipping companies, global associations, charities, P&I Clubs and others. Reflecting the growing focus on the issue, the crew wellbeing was at the heart of ‘Day of the Seafarer 2018’ on 25 June 2018. On the occasion of 'Day of the Seafarer 2018', the ITF Seafarers’ Trust and the World Maritime University announced a new crew welfare training programme to equip maritime professionals with key skills to support welfare onboard. Maritime Welfare (MARI-WEL) Professional Development Programme will be delivered as a distance learning course via an online portal, enabling participants to follow the programme from anywhere in the world. It constitutes the first programme of its kind to deliver a comprehensive overview of issues that relate to seafarer welfare. In response of this year's Day of the Seafarer 2018, members of ECSA; UK Chamber of Shipping and the Royal Dutch Shipowners Association have each launched webpages signposting seafarers to mental health charities, chaplain services and support networks. In a joint initiative on World Mental Health Day 2018, the American Club and Seamen’s Church Institute (SCI) announced they will produce a new guide, Caring for Seafarers’ Mental Wellbeing. 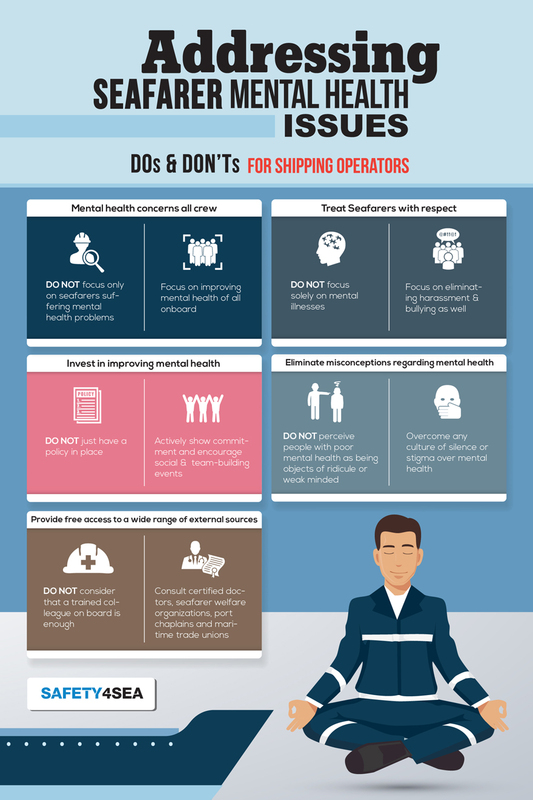 In May, UK Chamber of Shipping, Nautilus International and the National Union of Rail, Maritime and Transport Workers (RMT) created new guidelines to help shipping companies set up policies on mental well-being. In partnership with MHG Insurance Brokers, ISWAN announced the launch of a survey for seafarers who work on superyachts to investigate welfare issues to this specific sector. The UK Chamber of Shipping, Nautilus International and the National Union RMT jointly issued guidelines to shipping organizations on drawing up policies on the social, psychological and emotional well-being of the crew onboard. This year, UK P&I Club received the SAFETY4SEA Initiative Award, sponsored by MacGregor, for its 22 year-Crew Health/PEME Program and for further inspiring several other Clubs to follow this initiative in creating their own crew health programs. Encourage staff to be open about problems they are facing. When they do talk, listen, be respectful and do not make assumptions. Encourage involvement on decision-making and finding solutions. Focus on Fatigue Management by incorporating it to SMS. Increase the levels of support seafarers receive while onboard. Encourage staff to seek further advice and support (for example from buddying or mentoring schemes). Educate and familiarize crews on personal resilience. Exercise: Exercise can clear your thoughts and get into a better state of mind to deal with your problems. Rest well: Take time for yourself, relax or connect with others on board. Eat well: A healthy diet is the A and Z to a sense of wellbeing. Socialize: Spend time with others. This can give anyone a sense of time out and can be a good distraction. Identify what is causing you stress: A list of stressful can relieve some pressure, while talking it over with someone trustworthy can also be beneficial. ISWAN and Shipowners Club have issued a roadmap for identifying the causes of stress. and an infographic for managing your worries. Get a quality sleep: set an alarm at a regular time each day, avoid computer and when you go to bed, and use your bed mainly for sleep. Take a breath: Learn about the technique of controlled breathing. Don’t keep problems to yourself: Share your problems with a person which is close to you, even onboard or ashore. Give to others: Even the smallest act can count, whether it's a smile, a thank you or a kind word. This is as much as the seafarer can do for theirselves. Wellbeing is a personal issue to some extent, but conditions can also be impactful. 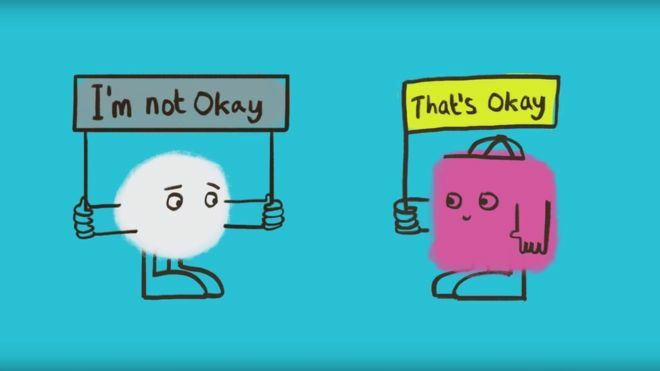 On Mental Health Day 2018 we'd like to remind all people to put their well-being first. However, sending positive thoughts and supporting anyone struggling with mental health issues should not be limited only to that day. In this context, we should always work together to give people the support they need and have empathy for those struggling. Notable efforts so far demonstrate that shipping is part of the action toward destigmatizing mental health and improving wellbeing across the industry!